The Island has another 1074 Lifesavers and we’re still counting! We are extremely thrilled to announce that yesterday on World Restart a Heart Day (RSHD) we taught a total of 1046 people lifesaving skills. Yesterday saw Yesterday saw 14 Tutors from the IW NHS Trust and elsewhere, 12 Volunteer Community First Responders (CFR’s), 17 Fire Service Staff and 3 IW NHS Trust Support Staff deliver yet another successful RSHD to the Isle of Wight Community. 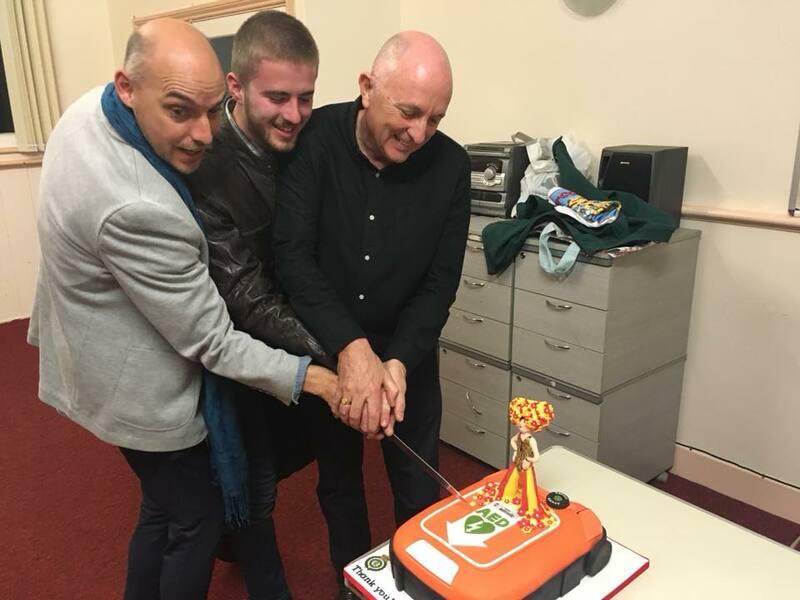 I am enormously grateful to all the Tutors and CFR’s who helped to deliver the training sessions, the Isle of Wight Fire and Rescue Service for accommodating the Tutors and all those who supported us to make this event such an amazing success. It really would not have been possible if it wasn’t for everyone working together. The enthusiasm of the school staff and children who participated was wonderful and the public engagement really was quite humbling to see. We still have a couple more planned fully booked CPR (Cardio-Pulmonary Resuscitation) training sessions to deliver this week and these learner numbers will also be added to final 2018 RSHD figure. This means by the end of the week we will have smashed our 2018 RSHD target of 1000! In the event of a cardiac arrest, every second really does count, that’s why it is absolutely vital that the community know how to recognise cardiac arrest, phone for an ambulance and if possible start CPR. Thank you so much once again, to all those involved in this year’s RSHD. Louise Walker, Head of the Ambulance Training and Community Response Services, IW NHS Trust. This year, Restart a Heart is going global! For the first time, it will be called World Restart a Heart under the oversight of ILCOR – with support from resuscitation councils covering America (North, Central and South), Canada, South Africa, Asia, Australia, New Zealand, as well as Europe. Once again, it will take place on 16 October, although events will occur on and around that date. Help us to reach our target this year of training 1000 people on the Isle of Wight in how to help save a life. This year we intend to be bigger and better! Invitations are being sent to schools for years 6, 9 & 10 and to home educated children to attend our free, interactive CPR training. These sessions will be delivered by Isle of Wight NHS Trust staff, supported by our Community and Co First Responders. Thanks to the IW Fire & Rescue service we have eight different venues to offer. Please like and share our facebook post to raise awareness of the event and help us reach our 1000 target. 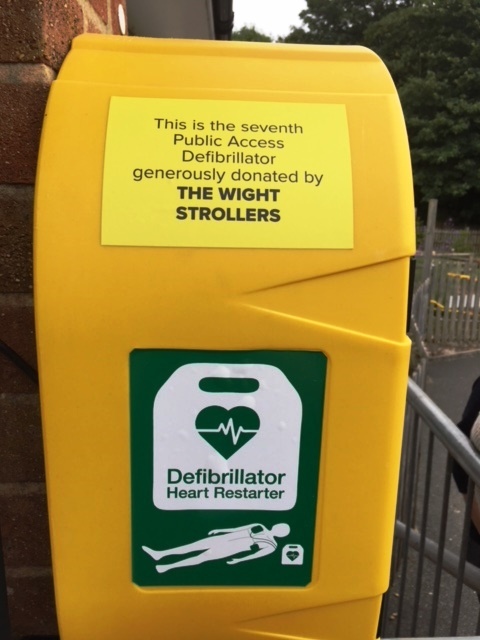 Following their production of Priscilla, The Wight Strollers have generously donated two more Public Access Defibrillators (PAD) bringing their total PAD donations to NINE! Past, Present, Future of the NHS – Wednesday 4th July at the Riverside Centre, supported by UNISON. 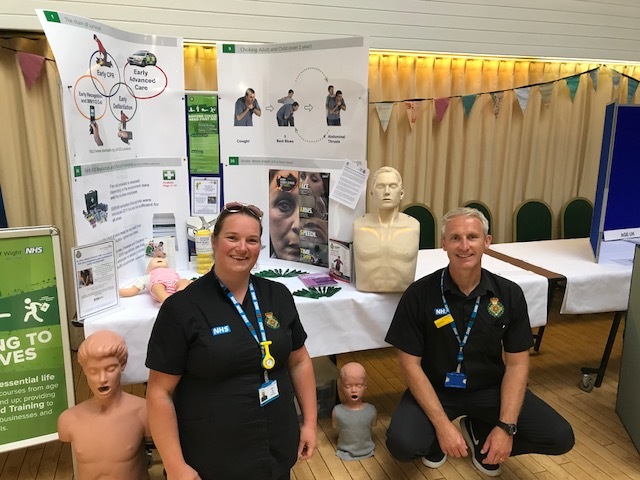 On Wednesday 4th July, the eve of the birth of the NHS, Duncan and Helena joined Colleagues from across the NHS Isle of Wight and Community support sector to exhibit in the 70 years 'present' section of 'Past, Present and Future, celebrating 70 years of the NHS'. The event displayed how the NHS has evolved from it's birth 70 years ago (morning session) through to the current services (afternoon session) that are available to assist people to; self treat, community support services available when help is required and where unavoidable Hospital Care facilities. Also displayed were the NHS Services and community organisations providing supplemental support at the point of discharge from Hospital back to the Community. 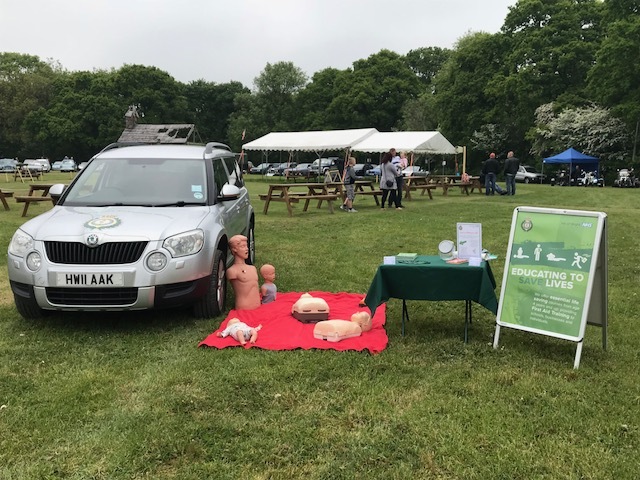 Helena and Duncan enjoyed teaching CPR to our stand visitors at our NHS Isle of Wight birthday fete on Sunday but soon sort shade by our colleagues major incident vehicle in-between visitors! 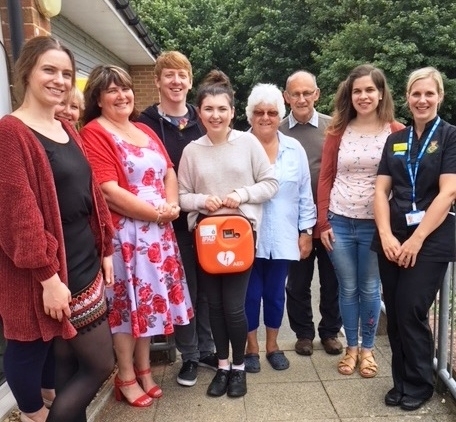 The Wight Strollers with the Head Teacher of St Thomas of Canterbury, Maggie Sanderson (third from left) and Louise Walker from IW NHS Trust Ambulance service. ‘Words cannot express our sincere gratitude to The Wight Strollers and The Island Savoyards theatre groups for their generosity; they really are true credits to our Island community. Shalfleet Primary School proudly shows that their IW NHS Trust defibrillator is now available 24/7 thanks to The Island Savoyards. A cardiac arrest is when a casualty becomes unconscious and is not breathing normally because the heart has stopped pumping oxygenated blood around the body. A defibrillator will analyse a casualty’s heart rhythm and will only shock them if needed. For every minute that passes without defibrillation and Cardio-Pulmonary Resuscitation (CPR), chances of survival decrease by around ten per cent. It’s the first three minutes that are absolutely time critical with regards to recognition of cardiac arrest, good quality CPR and early defibrillation. Cardio-Pulmonary Resuscitation (CPR) is a first aid technique that is needed if someone is unconscious and not breathing normally. If someone is unresponsive and not breathing normally, call 999 or 112 for an ambulance. Then, if you can, start CPR straight away. Using your body weight (not just your arms); press straight down by 5–6cm on their chest. Try to perform chest compressions at 100-120 compressions a minute. For further information contact Isle of Wight NHS Trust Corporate Communications & Engagement Team on 01983-552003. Further information about health services can be found at www.iow.nhs.uk or www.nhs.uk. Community First Responders are local unpaid volunteers who are trained and dispatched by the NHS ambulance service to attend life threatening medical emergencies and provide life support until the arrival of the local statutory NHS Ambulance Service. Research has shown that in cases of cardiac arrest, fast access to emergency life support skills and equipment can increase pre-hospital survival rates from 5% to as much as 74%. There is also sufficient evidence that in the event of a cardiac arrest where the casualty’s heart is in a shockable rhythm, for every minute that passes without defibrillation their chance of survival decreases by 10%. Community First Responders usually use their own cars, no blue lights or sirens but being local means they can be on scene with a casualty in just a few minutes. They provide vital support until the arrival of the NHS Ambulance Service sometimes making the difference between life and death. We currently have nineteen Community First Responder (CFR) volunteers involved in the scheme on the Island and we also have two Co-Responders for the Island; these are Firefighters with medical emergency skills that are tasked and respond for the Ambulance Service. These pictures are of just some of the amazing Community First Responders and Co-Responders that help to save lives of people on the Isle of Wight. They attend monthly training and dedicate many of their own hours to meet all the competencies required of them. Emma Baxter is one of our IW NHS Trust Volunteer Community First Responders (CFR). She is trained by the Isle of Wight NHS Trust Ambulance Service to attend certain types of emergency calls that occur in the area she lives. She reaches potential life threatening emergencies in the first vital minutes before our ambulance crew arrives. Soon after becoming a CFR Emma’s Mother-in-law, Brother-in-law and her husband all needed the Air Ambulance. This is why Emma felt she needed to repay them in some way and decided to do a charity skydive! Emma is also a mother to seven children who have all now grown up and she has six grandchildren. She has always cared for people and after changing her life by losing a significant amount of weight she found a new zest for life and thankfully became one of our amazing CFR’s so she could give something back to her community. Emma is due to jump on 30th June 2018, please help her to raise her target of £375 or even beat it by pledging as much you can; every pound counts so please donate. JustGiving sends your donation straight to Hampshire & Isle of Wight Air Ambulance and automatically reclaims Gift Aid if you are a UK taxpayer, so your donation is worth even more. Alternatively we do have a collection pot held in the IW NHS Trust Ambulance training room, at Unit 18 Barry Way, Newport if you are passing with your loose change. We are also happy to come and collect any money your area has gathered. A certificate of appreciation was also awarded to the group for their exceptional support of the Isle of Wight NHS Ambulance, Community Public Access Defibrillator (PAD) scheme. Feeling just a little bit proud that we got the Isle of Wight NHS Trust Ambulance Service on the map, at the Resuscitation Council UK National symposium in Birmingham last Friday! Our Community First Responders are volunteers who are trained by us to attend certain types of emergency calls in the area where they live or work. Also pictured with them are some of the Fire and Rescue Service Co-Responders who attend similar calls. Their aim is to reach a potential life threatening emergency in the first vital minutes before the ambulance crew arrives. This picture is of just some of the amazing First Responders and Co-Responders that help to save lives of people on the Isle of Wight. Come and learn how to save lives with the ATCoRS team and the Isle of Wight Fire & Rescue Service at various Fire Stations across the Isle of Wight, look out for our banners on the Fire Stations and more information here over the next few weeks! We currently have ten Community First Responder (CFR’s) volunteers involved in the scheme on the Island and we also have two Co-Responders for the Island; these are Firefighters with medical emergency skills that are tasked and respond for the Ambulance Service. We very much welcome our 11 new CFR’s who will soon be joining the team following successful completion of their foundation training. Our vision is to continue to provide a professional Community First Responder coverage across the Isle of Wight to support the IW NHS Trust Ambulance Service and ultimately increase the number of volunteers we have to provide as much coverage as possible in the geographical areas that need it. 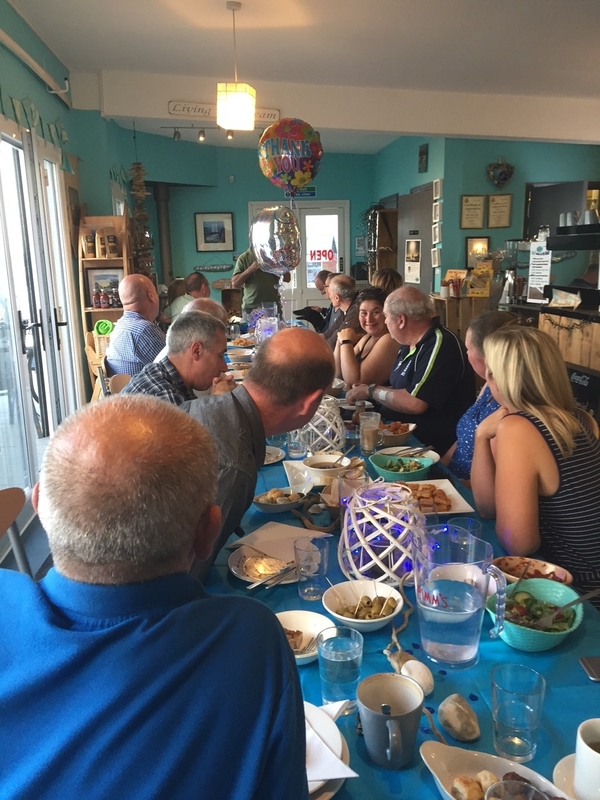 Last Friday we were privileged to enjoy an evening with our wonderful Volunteer Community First Responders and Co Responders as we hosted their summer thank you event, at the Salix Beach Café. Our interim CEO Maggie Oldham was present to thank the volunteers for the amazing community work they carry out for us. Chris Smith, Clinical Director and Head of Ambulance also gave a speech saying what an asset the Community First Responder Scheme is to the Ambulance Service and how the volunteers are very much appreciated for all they do. We currently have total of 12 Community First/Co-Responders with a further 11 soon to be joining the team following successful completion of their foundation training. Community First Responders are local unpaid volunteers who are trained and dispatched by the NHS ambulance service to attend life threatening medical emergencies and provide life support until the arrival of the local statutory NHS Ambulance Service. Community First Responders usually use their own cars with no blue lights or sirens, but being local means they can be on scene with a casualty in just a few minutes. They provide vital support until the arrival of the NHS Ambulance Service, sometimes making the difference between life and death.